Have you met Dylan Kennedy? 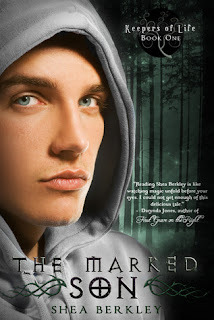 He's the blue-eyed hottie on the cover of this book, The Marked Son by Shea Berkley, and we are hosting the Meet Dylan Kennedy Blog Tour (presented by Entangled Teen). 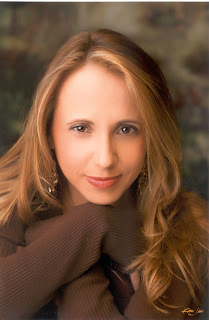 We have our interview with the author (please read this, you will enjoy Shea Berkley's responses) and there's a giveaway on Facebook to win a copy of this book (link is below). Well, a long time ago, when the stars shone one bright night in a little room in Florida, a man and a woman (we’ll just call them Mom and Dad for no specific reason) decided they’d take the strange little child the nurses assured them was theirs home, so the first thing I ever put to paper was my tiny footprint. Thus began the journey… wait, my publicist is shaking her head. Apparently I’m going back too far. Fine. I’ll skip ahead. It’s sadly not the most exciting story. I was in college and for some crazy reason, I declared myself an English major because, well, I had no other idea what to declare and was completely ignorant declaring English meant I had to actually take like a boatload of English courses. (sigh, so messed up!) Anyway, as I waded through the curriculum, my creative writing professor tried to strong-arm me into taking his advanced class. Being the bright person I was, I rejected the notion and switch my major to Phs. Ed. Then that thing I call THE MIRACLE happened. I found out I was extremely clumsy by way of a baseball to my head. Not fun, but it pushed me back into English. Oh geesh, apparently I’m still too far back. My publicist brought in her assistant and now they’re both glaring at me. Okay. I was exiled by the American government to the wilds of England and to keep my sanity one night, I decided to write down my thoughts. True story. Oddly enough, I amused myself doing so and kept going until a “book” appeared. I’ve never thought of myself as a writer per se. I actually think of myself as an entertainer. There’s a lot less pressure involved with that moniker. I mean, people expect depth and insight from writers and entertainers can just have fun and then disappear until they’re called on to bring on the party, ya know? But to be specific, I started admitting to writing when I realized I have absolutely no real world skills that can’t get me arrested. How do you go about your worldbuilding? There is a lot of time spent staring out the window or just lying in bed. To the untrained eye it looks like I’m a laze-about, but I’m actually thinking. Deeply thinking. I know that vacant look on my face and that bit of drool at the corner of my mouth points to inactivity, but trust me, it’s a deception I’ve cultivated through the years. Why a deception? I have no idea. I guess it just sounds better than admitting to having a vapid expression most of the day. Okay… I’ll try to answer your question in a pithier manner. Sadly, pithy and I are not friends. Here we go… I actually worldbuild as I write. When the story is done, it’s only then I see what I’ve created and go back and really solidify what’s there. I have to make my characters consistent within the world I’ve created, which isn’t labor at all to me. It’s the fun part. I have this teeny, tiny Peter Pan mentality. I hide it well, don’t I? But it’s a struggle. To be perfectly honest, I don’t write for teens. My characters just happen to be teenagers because there is so much newness going on in that age and it makes for great stories. Seriously, go into any high school and you will walk into a bubble of drama, drama, drama followed by laughter and silliness and double dares. Why wouldn’t I want to write for teens? Which character spoke to you first? Were any easy to write? Any difficult? Dylan spoke first, which was convenient since the bulk of the book is in his point of view. He’s really easy to write. I once had an agent tell me I have a teenage boy living inside me. I can see why she might say that. I’m not a girly-girl, though you wouldn’t necessarily know that from looking at me. Kera was the most difficult to write. It took me a long time to figure her out. Thankfully, I’ve got a bead on her character now and she’s become a lot easier to put on paper. The Marked Son is the first book in a three book series. I live in fear of the second part of your question. I don’t like talking about the books I’m writing. I can say this, The Fallen Prince, which comes out spring of 2013, is about Dylan and his fight to free Teag from those who are trying to take control after Navar’s death. The third book is about Dylan trying to save those who he least cares about, and fighting against those he thought he could trust. Can you share with us your journey to publication? Man, how much time do you have? It was a rollercoaster journey of almost being bought so many times I started getting a complex. For the longest time, the marketing department was my enemy. I have never neatly fit into a specific place, which is a marketing nightmare. I tend to genre blend, which is evident even in The Marked Son. Believe it or not, I really do try to behave by the rules, but all I really know what to do is write a story I want to read. Anyway, the journey was long, convoluted, exasperating and illogical at times. Honestly, I don’t know why anyone would want to become a writer. It’s one of the hardest jobs ever, and one with an insane amount of rejection. I’ve been writing fiction for a good while now. Before that I wrote nonfiction. Nonfiction is like riding a bike uphill, seriously hard work getting to the top. Fiction is like riding a bike uphill while dodging falling boulders, deep potholes and angry grizzly bears. You probably have talent, but if you get to the top without getting squashed, or getting stuck in a hole or getting mauled, then you’re just plain lucky. Honestly, most sane people chuck the bike and hike back home and never tackle the hill again. The view, to them, isn’t worth the struggle. In conjunction with this blog tour, we're hosting a giveaway of THE MARKED SON on Shea's new series Facebook page! Click the link to enter.